Please come and visit Gold Bay located on Burntside Lake! 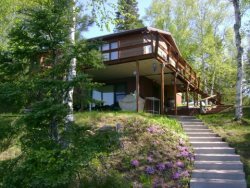 This is an amazing private retreat on the outskirts of the Boundary Waters Canoe Area Wilderness. Crystal clear water and a beautiful extended beach. This summer home offers plenty of room for your family to enjoy our great northwoods. There is ample room for multiple families to enjoy the seclusion abound by this property. Three bedrooms, each with a queen beds. Loft has a twin over full bunk. For extra guests you can utilize the queen bed in the sauna and the queen sofa sleeper in the living room. The main house has a bathroom with shower. On those cooler summer nights, enjoy a nice 'steamer' with a newly updated sauna. The sauna does have an extra shower and a sink. Take a stroll through the 100+ year old cedars to enjoy a spectacular sunset lakeside and listen to the loons. There is a 21ft, 70hp pontoon that is also available to rent with this property. You may select it when making this reservation, or give a three week notice prior to your arrival if you should decide you would like it. Well stocked kitchen with a, microwave, toaster, coffee pot, all utnesils, pots/pans, dishes, soap, garbage bags, kitchen towels and hot pads. 7 miles from Ely, Burntside Burntside Lake is one of Ely’s most scenic, historical, island studded, and pristine lakes in the area. Water sports abound here - canoeing, boating, skiing, and fishing. A deep water lake of over 7000 acres, fishing on Burntside centers on lake trout which have been stocked here since 1912. Fishermen also enjoy nice populations of walleye, smallmouth bass and northern pike.